Institut Karite Paris pays tribute to French poets and celebrates the bloom that heralds the arrival of spring, delicate Cherry Blossom. 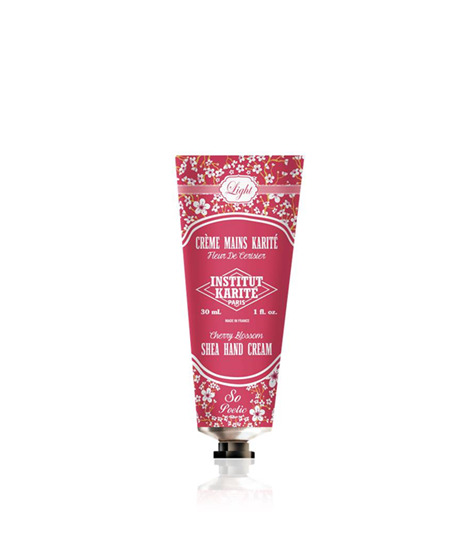 Treat your hands to this Shea Hand Cream with a romantic floral design. Enriched with Shea Butter, this Light Shea Hand Cream will help you to keep your skin soft and supple. Delicately scented with Cherry Blossom, its light and non-greasy texture quickly seeps into your skin and leave it feeling refreshed. Perfect for spring and summer seasons. Your skin will be delicately perfumed with floral and elegant notes. This flower-adorned cream will gently care for your hands. So Poetic ! Its handy mini-tube can be easily slipped into a handbag or kept on a bedside table, to ensure this nourishing concentrated treatment is always close at hand. INGREDIENTS:AQUA (WATER), ETHYLHEXYL STEARATE, GLYCERYL STEARATE, DIMETHICONE, GLYCERIN, CETEARYL ALCOHOL, PARAFFINUM LIQUIDUM, PARFUM (FRAGRANCE), POTASSIUM CETYL PHOSPHATE, PROPYLENE GLYCOL, PHENOXYETHANOL, BUTYROSPERMUM PARKII (SHEA) BUTTER, CERA MICROCRISTALLINA, CARBOMER, TRIETHANOLAMINE, PARAFFIN, CHLORPHENESIN, HEXYL CINNAMAL, DISODIUM EDTA, TOCOPHEROL, SODIUM CETEARYL SULFATE, SODIUM LAURYL SULFATE, LIMONENE.